This week we practiced spelling words with Little M’s cousin. Since they are in the same class I thought it would be fun to make a game out of their practice (we do love a good game around here). They both loved it… so I thought I would share. Even if you don’t have a partner for this game, keep reading. I’ll give you some tips for solo play! 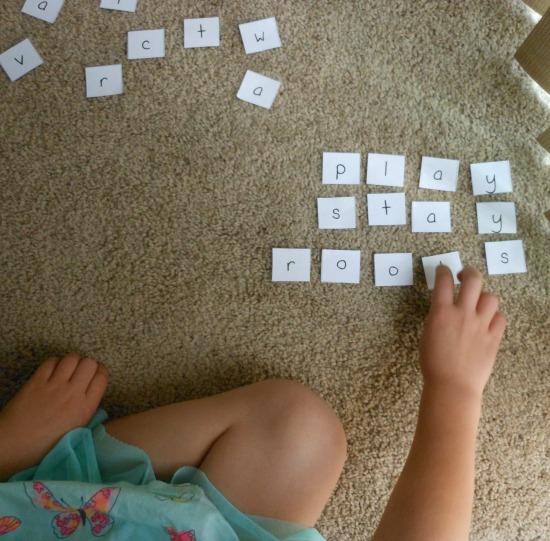 What you need: spelling words (if you don’t have your own list you can find one here, add link), paper, printer or marker, players. To prepare the game I typed out the words. I wanted them spaced evenly so I created a table in Word and then eliminated the lines. Each letter got it’s own box. If you don’t want to go through the hassle of printing the letters, you can write them each on a small square of paper. You’ll need a set for each player. I placed the letters on the floor, giving both girls their own space. After making sure they were both ready, I said one of their words. They raced to build the word. The person who completed the word first (and correctly) won that round. I had the girls spell the word out loud as they moved the word off to the side. Then we went on to word number two. As the game went on there were less and less letters to choose from. For the last word the only letters that were left were the ones to make the last word. Instead of saying the word, I asked the girls to unscramble the letters and tell me what they spelled. These words were not brand new to the girls. So for our game I simply read the words out loud. If these words were more challenging or new, I would have also made cards for them to look at. If you have two kids at different levels you could give one of them a card to look at and have the other one spell it on their own. For only one player, set a timer for 30 seconds. Can they beat the clock? Or reverse it and use a stop watch. How long did it take to make the word? Can you beat that score next time? Some of our favorite ways to practice spelling words have been making a giant crossword puzzle, touch and learn cards and the spiderweb search. 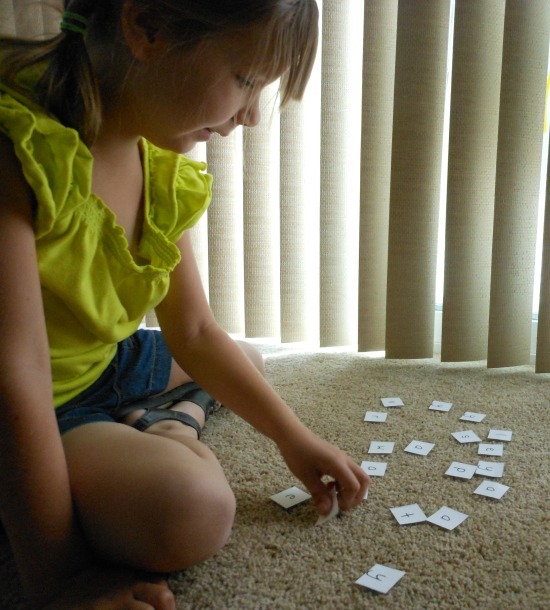 Share your favorite way to practice spelling in the comments! I love this idea! 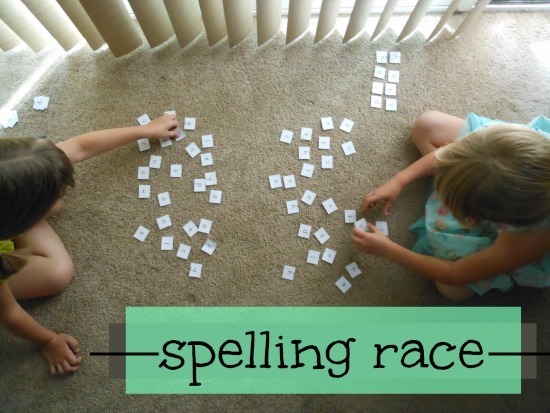 I will have another second grader joining us for school this summer, so this will be a perfect spelling game! Thanks for the idea!